It’s the kind of weather you would expect forging a path bravely across the Atlantic Ocean: lashing rain, massive waves and high winds strong enough to whip waterspouts into the sky. The rain masses into torrents of water that cascade down the portholes and into the cabins through leaky vents. Our cabin, a four-person “inner” cabin with no outside windows, leaks the worst. In fact, the drip centres on my bunk, where my head is supposed to lie, so instead I flip around and curl up into a ball so I don’t end up with wet feet. Everytime I turn, I cringe as the plastic-covered mattress crinkles. This isn’t the Atlantic. It’s the Whitsundays, and our soft sailing sojourn has turned into a rock and roll (literally) adventure. The Anaconda III sits in the harbour, a massive blue and white mega-yacht waiting to be boarded. She’s easily one of the bigger yachts there and holds 31 passengers, plus crew. After a short safety brief, everyone is handed their own bonafide stinger suit for all the nasties in the water. Then some bubbly is handed out to all, intros are made and we’re shown into our “cozy” (read: cramped) bunks. Water is on a strict ration: one one-minute shower per day. Before we shuffle off to bed, Tim – our skipper – asks for the Canadians on board to identify themselves. Three hands go up; myself and a couple from Kamloops, B.C., Rob and Kara. The other passengers fix us with an evil stare and wouldn’t you know it, a drop of water lands on the top of my head. Kara, Rob and I scurry away before we can be lynched. Whitehaven Beach is normally the picture-perfect oasis of everyone’s dreams. The crew drop us off, with two hours to kill. We swim (in the rain), play beach cricket (in the rain) and sunbathe (yes, there was a fleeting moment of sun!) It rains some more and we pray for the crew to return in their tender, but they seem determined to give us the full two-hour beach experience we paid for. Back on the boat (finally), we realize why we wear stinger suits: huge jellyfish float idly by, unaware of the dread they cause in many hearts. My first dive is later on that afternoon at Luncheon Bay, off Hook Island. It is a fringing reef dive, which means the reef hugs the outline of the island; an easy site, difficult to get lost but with a huge range of corals and fish. The snorkelling is equally as good, with the water being so clear and the coral so close to the surface. Sarah and I muck around with an underwater camera; I can only imagine the beauty of the reef with the sun shining. The food on board, cooked by Kelly, is nothing short of superb. There’s plenty of it, too, but the heat inside the galley is intense. Tim orders the awning up to shelter us from the rain, so we can sit outside. It isn’t long, though, until we hunker back down, exhausted from diving and snorkelling. 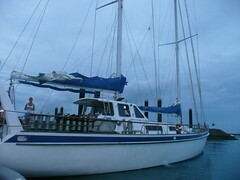 At five in the morning, Anaconda III sets sail again out toward the outer Great Barrier Reef. I wouldn’t have known it had it not been for the sudden but constant thunder of our bathroom door against the toilet. Bang against the door frame, the boat lurches, bang against the toilet. There is no way to secure it, although we are valiant in our efforts. As soon as Sarah gets up out of bed though, she is forced to run up on deck. She is not alone. Others join her in her queasinses, though fortunately I avoid it. We anchor at Bait Reef, which looks as though it is in the middle of nowhere. Scuba diving here is scarier than anywhere else – at least at other dive sites, I could always see land. I brace myself for what is supposed to be one of the best dives in the Whitsundays. I’m not disappointed. We spy black-tipped reef sharks feeding on the bottom. We watch one for a good while before it up and swims away, tired of spectators. No sooner had we turned our heads than an Eagle ray swooped around the mountain of coral, its face unlike any I have ever seen before, on land or in sea. It’s always the big fish that get a mention, but when I’m down there, it’s the small things that capture my imagination the most. There are the feather worms that look like the dust busters of the ocean. Or the scores of minnows that swarm around you as you swim, their silvery bodies catching the light like sparkling, falling confetti. This dive, my tenth, is the best so far, for this mix of big and small. Leaving Bait Reef is when the massive storm hits. A few brave souls (Sarah, but not myself) face the storm on deck. Sarah rushes in to tell me she almost went overboard. This, combined with the fact that she was stung by a jellyfish, makes me reconsider her ‘cursed’ status. But her contagious smile has never left her face since boarding the boat, and it is fun. If this isn’t sailing, what is? Tim fixes our bathroom door with some string and a nail. It does the trick and we sleep soundly. The morning breaks much clearer than the night before. We snorkel again and feed the fish with mouldy bread. The fish here are clueless of the imminent danger humans bring and swim right up to our masks. Who said they are more afraid of us than we are of them? We spend the morning at Blue Pearl Bay but move on quickly to get back to Airlie Beach. In a final salute to us, it is raining again. But although the tan didn’t deepen, the beach wasn’t picturesque and the reef didn’t sparkle, the rain bound everyone together so that a whole ship of strangers sailed back into harbour as friends. And thus ends the saga of the Wetsundays. Arriving in Cairns after Sydney is like entering a new country. I’m sure that had we eased ourselves into the tropics by following the east coast, we wouldn’t have been struck so hard by the differences between the two places. 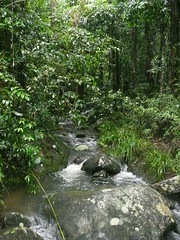 Cairns is nestled by mountains covered by some of the oldest rainforest in the world. The temperatures soar into the 30s and the rain is like bathwater. Even if there is no rain, the humidity soaks you through anyway. Dripping sweat and backpacks do not mix, but it definitely makes one appreciate a nice cold shower. The Daintree National Park is officially the oldest rainforest in the world. A World Heritage site, it fulfills the wildest of anyone’s “Jurassic Park” dreams. Huge ferns create shade on the muddy pathways. Forest dragons skitter into the brush on their hindlegs. And because of the pouring rain, creeks transform into raging rivers, rushing jellyfish, crocodiles and poor tourists’ flipflops into the ocean. The best view of this awe-inspiring rainforest comes from the inside of a boat on a Daintree River cruise. I have complained so far that Australia isn’t as amazing as Africa because it is difficult to feel “away from it all” when you spend most of your days inside a shopping plaza and surrounded by other tourists. But this is incredible. Suddenly, it isn’t 2008 at all but millions of years ago, and we are the privileged few who get to go back in time and witness a place where humans are not even a twinkle in evolution’s eye. There aren’t many places in the world you can do that, I think. It is definitely the only place in the world where two World Heritage sites collide in one place: the Daintree Rainforest National Park and the Great Barrier Reef Marine Park. We spent the night in PK’s Jungle Village, Cape Tribulation. Cape Tribulation gets its name from Captain Cook, whose boat hit the Great Barrier Reef and began to sink with him in it. Hence “Tribulation”. It has certainly earned its frightening moniker throughout the years. Only a few kilometres away is Snapper Island, and it was there, at the mouth of the Daintree River, where famed Crocodile Hunter Steve Irwin was killed by a stingray. Cape Tribulation is also where the gear of the lost “Open Water” scuba divers washed ashore. Their boat left from Port Douglas, not too far from where we were staying. The fact that I was about to dive in the same spot where the divers went missing filled me with only a little trepidation. This being stinger season and all, could I have chosen a more dangerous place and time? Our ship was called the Rum Runner III and it took us out to the magnificent Undine reef, one of the northernmost points on the Great Barrier Reef. 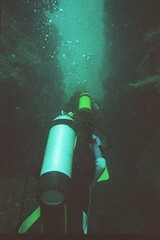 In a spot called the “fishtank,” my dive partner Rasmus and I headed out into this most famous of diving spots. The coral is magnificent. Huge fans swaying the current, moved by a watery geisha’s hand. There were pufferfish and stingrays and jellyfish and, of course, Nemo himself frolicking amongst the anemonaes. Alicia, our dive master, was quite interactive with the marine life and brought us a seaslug to snuggle (slimy and very sticky), a giant clam to hold and a Maori wrasse to tickle. She even bounced a jellyfish on the palm of her hand, but I wasn’t having any of that. I still feel too much like a stranger underwater to want to test my luck. 12 hours on a Greyhound bus later and we are sitting in Airlie Beach, about 600km south of Cairns. Tomorrow we embark on a 3-night, 3-day sailing adventure aboard the Anaconda III and I will get to go diving again in the Whitsunday Islands. So whoever amongst you that call Sarah and I cursed because of the weather, I will take cursed any day if it brings me to places like these! Now that the intensity of holiday week is over, Sarah and I have opted for a few days of peace and tranquility unmarred by the headaches of hangovers and bad photographs. Not to say that this hasn’t been one of the most fun weeks of my life, but it is nice to get out of the hectic city. We spent the better half of the morning on New Year’s Day pacing through the Chinese Gardens at Darling Harbour. A hidden oasis in the city, the Chinese gardens were designed by architects from Sydney’s “sister” province in China, Guangdong. I could have spent forever walking over the stone bridges and staring down at the carp playing in the stream’s current. There were beautiful pagodas and archways around every corner. I ended the visit with jasmine tea and dim sum in the teahouse. It was a perfect way to contemplate the year to come and a very “zen” start after the night before’s crazy antics. Today we left the city altogether and headed for the Blue Mountains, about a couple of hours away by train. Altogether misjudging what altitude does to temperature, we arrived in shorts and t-shirts to utterly freeze in the mist covered mountain range. Ignoring the goosebumps covering our legs, we hopped on board the Trolley tour from Katoomba station straight to “Scenic World.” Katoomba is a strange mix of quaint b&bs and seedy looking restaurants, clearly suffering from an ill-conceived makeover from mining town to tourist hub. Scenic World itself reminded me of the Penguin Parade in Melbourne: theme park-esque in its dedication to being tourist-friendly. Everything is brightly signed, clean and exaggerated. In a way it is a shame that it is so over-the-top, since the Blue Mountains themselves are so beautiful. We can easily see that ourselves; we don’t need to be told so by laminated brochures. Indulging in all that the Blue Mountains have to offer, Sarah and I rode the steepest incline railway down into the valley and then the cable car back out. They are not exaggerating on the steepness of the railway. With a little jammy begging (and maybe some winking? I’m not sure…) Sarah and I managed to score the very front seat. It was literally a “hold onto your hats” moment as we crept over the edge, faster and faster. Now I may have bungeed… jumped out of a plane… swung through a gorge… but it still didn’t stop my throat from catching just a little. Tomorrow we descend upon the East Coast with vigour. We’re zipping through – our gorilla tourism at its best – hopping from place to place in a month. The weather forecasts are pretty grim for the east coast, to say the least. If it ends up being awful, we’re heading back down to Melbourne for some Australian Open action — I wouldn’t be exaggerating to say that seeing Federer in action may just make my trip. The title of this post is stolen from the Sydney Morning Herald headline on January 1st, which featured an awesome photograph of the fireworks finale and a picture of a group of guys staying in the hostel room next to us! Wakeup! is definitely the place to be staying at this time of year, and we love Sydney so much that we’ve decided to spend an extra couple of days here. Our decision may also have been influenced by the fact that the weather up the East Coast is supposed to be absolutely awful until the end of February… can you believe that? I think we may have to hightail it back down to Melbourne if the forecasts are accurate. New Year’s Eve in Sydney is legendary, and with all that hype you’ve got to think that there is going to be some disappointment somewhere. There wasn’t. The debate over where we were going to view the fireworks raged until the morning of, when we finally decided on Christison’s Park. It is one of the furthest vantage points but offers a complete view of the Opera House, Harbour Bridge and the harbour itself. A great decision. We arrived at around 1pm to a huge green field and a perfect view. We spread out our picnic blankets and gorged on smoked salmon and cream cheese sandwiches, baguette, tim tams and Veuve Cliquot. Not bad for a couple of flashpackers! A group of people from our hostel joined us, we partied on the field and watched the every-hour-on-the-hour flybys and writing in the sky. The family fireworks set off at 9pm. 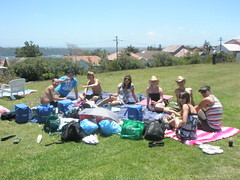 By this time our empty field was almost full to the brim with families and backpackers enjoying the view. One of the girls had a radio and we listened to the synchronized music as the fireworks filled the sky over Sydney. The Simpsons themesong played as huge “S”‘s appeared in the sky. Mika’s Everybody’s going to love today played as the fireworks exploded into hearts. It was very cool and went off without a hitch. By now it was pitch black and we decided to pack up and head to somewhere a little closer to the action. Sarah and I went to Neilson’s Park on the other side of the promonatory from Christison’s Park. We parked ourselves down on the beach, opened some more champagne and witnessed some of the most spectacular fireworks I have ever seen. There was no countdown to midnight but a huge cheer as the first explosion set off over Harbour Bridge. All in all an incredible new years, one of the best ever, and I just want to say… Happy New Year Everybody!! Sometimes aquariums can seem “same old, same old,” but the Sydney Aquarium is quite special. The Great Barrier Reef exihibit is particularly spectacular with massive sharks and rays and a huge number of fish. I can’t wait to get to the reef itself. We should be there in a few days and since getting my PADI in Zanzibar, I’ve been looking forward to scuba diving in the Whitsundays. We spent the rest of Sarah’s birthday getting silly on the pedalo boats at the harbour and in the arcades. She whooped me at Dance Dance Revolution but I got my own back in the driving games. We went out to dinner at Dock in Darling Harbour, then out barhopping for drinks around Watershed, Pontoon and Cargo. 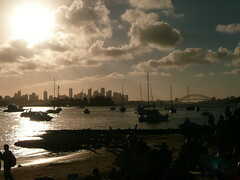 There is no shortage of places to go out in Sydney, and during the Christmas holidays it is buzzing with activity. Today we took the long stroll from our hostel up to Circular Quay. Circular Quay is the postcard place of Sydney. From our perch at the front of the Manly Ferry, we could see the Sydney Opera House, the Harbour Bridge and the Sydney sky tower. Tons of yachts sailed past beautiful condo buildings on the waterfront. Sydney is incredibly photogenic and today, with the sunshine out in full force (finally), it was truly showing off its beauty.